A spider and an ant whose names are drawn from references in popular modern-day literature, a brilliant pink katydid and an omnivorous rat are among the discoveries identified by ESF as the Top 10 New Species for 2017. The 10th annual list, compiled by ESF's International Institute for Species Exploration (IISE), also includes a strikingly colored freshwater stingray and two plants - a bush tomato that appears to "bleed" when it's cut and an orchid with the face of the devil. Two leggy creatures - a millipede with more than 400 legs and an amphibious centipede - crawled onto the list, which is completed by a marine worm that looks a lot like fried pastry. This tiny spider, less than 2 mm (a tenth of an inch) long, takes its name from the bewitched Sorting Hat in J.K. Rowling's beloved Harry Potter books. The shape of the spider's body - conical, with a jaunty bend at the narrow tip, is reminiscent of the hat first owned by the famed wizard Godric Gryffindor. The scientific publication describing the discovery states the name is "an ode…for magic lost, and found, in an effort to draw attention to the fascinating, but oft overlooked world of invertebrates, and their secret lives." Some discoveries are made when least expected. This spectacular new species of katydid was discovered while researchers were looking for tarantulas and snakes in Borneo. Named for the photographer of the only known specimen, Peter Kirk, Eulophophyllum kirki's most striking feature is its use of color and mimicry to blend into the foliage. The katydids are about 40 mm (1.5 inches) in length with the males uniformly green and females brilliant pink. The newly named species is amazingly leaf-like in appearance, including hind legs that are smaller, yet similarly leaf-like in shape and detail. 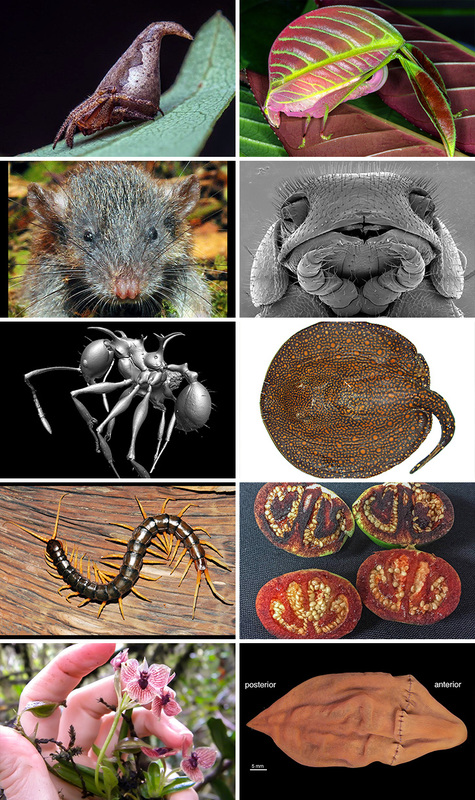 In what appears to be an evolutionary reversal, the newly discovered Sulawesi root rat dines on both plant and animal matter, making it unique among its strictly carnivorous relatives. The rat is known to sometimes feed on roots, and the name G. radix is derived from the Latin word for "root." It is most closely related to the Sulawesi water rat, with both belonging to a larger group, including shrew rats. With more legs than the Rockettes' Christmas Spectacular, Siphonorhinid millipedes can possess as many as 750 legs. With 414 legs, this new species has not yet broken the record number, but that could change. These animals continue to add body segments - and legs - throughout their lives. Long, thread-like - about an inch (20 mm) in length - and eyeless, I. tobini boasts an ancient lineage dating from before the breakup of the supercontinent Pangaea more than 200 million years ago. Discovered in Sequoia National Park, it lives in minute fissures and cracks below the soil surface. Previously, large back spines were assumed to be a defense mechanism. However, microtomography - similar to medical CT scans - suggests at least some of the spines serve as a location for muscle attachment. Major workers, or soldiers, have exceptionally large heads and mandibles used to crush seeds otherwise inedible to them. Large heads require large muscles that must be anchored somewhere, such as the spines. However, spines occur also in minor workers, with smaller heads, and not all spines are host to muscle attachment. This large, strikingly patterned freshwater stingray is endemic to the Tocantins River in Brazil. The type specimen is 1,110 mm (43 inches) in length; large specimens may weigh up to 20 kg (44 pounds). P. rex is among the 35 percent of the 350 documented fish species in the Tocantins River that are found nowhere else on Earth. The stingray is blackish to blackish-brown in background color, with intense yellow to orange spots that, combined with its size, earn it the title "king." The discovery of such a large and brightly colored ray highlights how incompletely we know fishes of the Neotropics. Considered critically endangered, the species is known only from southern Colombia where it is an epiphyte - a plant that grows harmlessly on another plant in moist, dwarf mountain forest. The orchid is known only from one highly vulnerable location currently threatened by reconstruction of a road that will negatively impact its habitat. There are about 3,600 species of orchids in Colombia alone, with hundreds of new species awaiting discovery.